I love bin inn's, health food shops, "ethnic" shops hmmmm wonderful looking products, great smells and always something tempting to try. However I have never had a specific reason to purchase stuff regularly. However this has changed. Very disappointed to find out a year or so ago that peanut butter really is peanut margarine. Yup that's right. 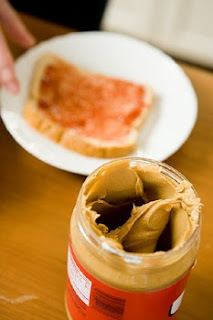 Ever wonder how they could take peanuts and oil and make the smooth creamy paste that is neither runny or solid? It is peanut marg! This was disappointing as we used it quite a bit as a quick sandwich filler when in a rush in the morning. Got to be better than a high sweet product such as a jam. Anyway you local Bin Inn has a machine that grinds up peanuts (shelled) straight into peanut butter. Apparently they use a special type of peanuts, that typical shop ones don't have enough oil to make the paste. Visit your local Bin Inn to purchase healthy peanut butter.